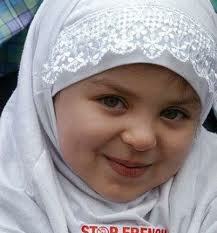 Hijab, an Arabic word, meaning curtain. This word is taken from soorah al-Ahzaab of the holy Qtur’aan,v.no. 53, which says wa- ‘izaa tas’alunna mataa’ an fas’aloohunna min waraa’i- hijaab” (and when you ‘o’ believers), ask them (the believers’ mothers)to give anything, then ask them from behind the curtain. Wives of the prophet sal. are prohibited to be married by any of the believers, by the order of Allaah. As mothers are prohibited by Allah’s order; similarly, by Allah’s order they are also prohibited. Still this restriction, because the devil is there to instigate for violating Allaah’s order. According to some interpreters this restriction is especially for the prophet sal.’s wives. Other women do not fall under this order. But the reason says when mothers should take caution to be safe from shaitan’s instigation then other women should take much more caution to be safe from the devil’s provocation. It is mention- worthy that Islamic laws were introduced in gradual process. First it laid down foundation of an obedient and duty-bound society which emerged from a chaotic, in-disciplined and most disorganized people. Their life -style became totally changed when they accepted Islam. The sweet and affectionate treatment of the prophet sal. made them a submissive, loyal, compassionate and law-abiding people. The infidels of Makkah made their life intolerable; so, they were permitted to respond to the invitation of the Muslims of Yathrib(the previous name of Madina). After their emigration to Madina, when laws started coming they readily accepted them. It is evident that restrictions on males’ and females’- free –mixing were obeyed without any objection or hesitation .In such an environment injunctions of hijab were revealed gradually.Objectives of hijab:The first objective is to ensure and guarantee the women( the honourable mother sect)necessary provisions, honour and safety of life.The second objective is ,as declared by Allaah swt. “And from among His tokens (mention worthy) is that He has created you from soil and then you are spreading as humans. And from His tokens this is worth- mentioning that He has created for you your wives so that you get peace and solace when going to her(individually when going back home); and He has made love and kindness among you. Verily there are so many tokens (of Allah’s existence) for the people who reflect. (30:20-21) The purpose of the second objective is to make and keep the beauty of the woman more and more attractive to the husband so that she can be loved by him most. The husband’s love is the greatest gift and the most precious bliss of Almighty Allaah. This love enables her care free and peaceful life. So, she also must try to adorn and act to the best of her knowledge and capacity to drag and attract the husband’s gaze to her. The wife or wives alone or they (up to four) would try to compete with the sharer or sharers which would make the husband more and more pleased having the diverse taste of beauty enabling him more energy in undergoing tough works outside home with manifold efficacies.All these tendencies are quite natural .Looking for different types of beauties is a born tendency which cannot be ignored. If it does not get legal sway, in most of the time, it would find out some other way secretly or openly. Islam is the system of life, given by the Merciful Creator, which provides for man all the legal processes for getting pleasure and joy through having the chance to come in contact with different types of beauties for those who have got the physical, material and mental balance to maintain justice between or among the wivesThe Creator is well Aware of the necessities and wants of His creation. He Himself has not given in the women the want of several husbands at a time if she is provided with her needs and loved by the husband dearly. Marriage- proposals are generally given by the men, who have to take the responsibility of maintaining the wife or wives and of the expected children .commonly the natural feeling of shyness, especially given by Allaah, is a hurdle in the way of proposals from brides’ side; though not prohibited. Muslims man can marry up to four woman, i know that muslims has a certain ruling for that, they do not argue with their god, they are very sincere with their God. At first, knowing that muslims can marry one woman, without understanding it thoroughly, All I can say before is that this is very unfair for their wives. But as understanding them, that one woman must achieve a perfect balance between his wives financially and in terms of his time. All I can say that even though I am not a muslim but I agree with them to for those man who can not have one partner only, rather than cheating and have one woman suffer. Professor Sulaiman farooqui is a famous writer and and translator of many books and articles. He have translated whole version of Tafsir Fee Zilalil Quran.